RAPID CITY — Three weeks into the new year and the Boys from the Black Hills continue to ride some rough waves as they look to get back to the level of success they enjoyed in the early going this season. They are currently sitting in 6th place in the Mountain division (24th in the league) with a record of 16-22-2-3 (37pts) through 43 games. Only the Allen Americans have played more games in the division. This is a far cry of where they were in November but there is still time to turn things around. 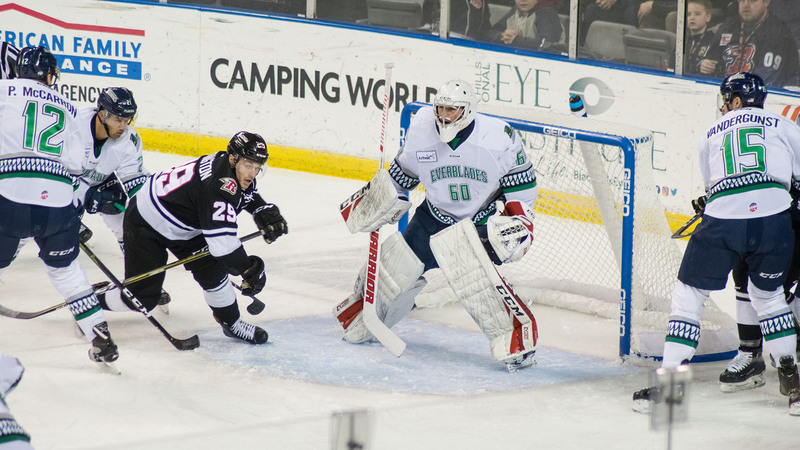 Rapid City recently completed a three-game series against the top level of competition in the league, the Florida Everblades. The final score of each game isn’t truly indicative of just how tight each contest actually was, being outscored 11-to-4 and posting a 1-2 record. Both teams were held scoreless during the opening period of their first ever match-up until a 7-second lapse allowed the visitors to building a 2-0 advantage. Rapid City had an opportunity to cut that lead in half on a penalty shot from Darby Llewellyn but the puck sailed wide of the net. Florida would tack on a late, empty netter followed by a “stat-padding” goal to shutout the Rush 4-0 during their mid-week contest. Friday was Rapid City’s annual “Rush Fights Cancer” night. The emotions ran high, as they always do with this game, and the home team came out swinging from the initial drop of the puck. The Rush got on the board first with a goal from Shaquille Merasty halfway through the opening frame. Recently re-acquired Justin Faryna scored the game winner, fittingly coming with 18 seconds left on the 18th day of the month (and his number is “18”). Was it fate to have such coincidences occur to lift the Rush to a win on such a special night? The visitors came out with a chip on their shoulder, not wanting to lose the rubber match to a team on a downward slide, and built a 3-0 cushion heading into the final frame. Mr. 500 Riley Weselowski, skating in his 500th game with the Rapid City Rush, pocketed a goal early in the final frame to spark some life into the home crowd. The excitement was short-lived, however, as Joe Cox scored just over a minute later to regain Florida’s 3-goal cushion and followed it up with another goal at the 10:44 mark for the 5-1 final. While the game sheet shows two one-sided defeats the Rush were never out of any of those games. The puck just seemed to bounce in favor of the visiting team. Prior to this match-up they were swept in a three-game series against the Tulsa Oilers, being outscored 15-4 against a team that the Rush topped in “extra hockey” three straight times back in November. Rapid City did come out firing in the first game of the series, lighting the lamp less than three minutes into the opening frame on a goal from Merasty. That would be as close the series would get as the Oilers poured it on for the remaining 177 minutes of regulation hockey to sweep the series. What will it take to regroup? What’s the biggest culprit to the slump this team has been through since early December? Head coach Daniel Tetrault attributes this downward spiral to injuries and illness. He is pleased to see the bug has almost left the roster with the players on a healthy dose of antibiotics and getting more rest to get healthy. While a few key cogs in the “Rush Machine” are presently unavailable don’t be surprised if getting a few healthy bodies back on the bench will help light a fire for the Rush as they hit the road. Saturday night was a big night for the captain as Weselowski skated in a Rush sweater for the 500th time. A feat you don’t see very often at any level of competition. While the Rush didn’t secure a win that night the “Man of the Hour” was able to find the back of the net to add to his accomplishment. Weselowski has cemented himself in this community over the years and has made it a point to give back as much as possible for all this organization has given him during his career. While the captain knows he’s nearing the end of his career is he ready to hang up his skates just yet? Coach Tetrault knows just how special he is to this team, contributing both on-and-off the ice and is a true leader to the youth of the team. It came as a great surprise that second year forward Andrew Radjenovic would jump ship and cross the Atlantic after being named a 2019 CCM/ECHL All-Star for the Western Conference. Through 40 games with the Rush this season the forward amassed 16 goals and 18 assists. While his on-ice presence will be missed we wish him well as he laces up his skates in Slovakia for the HK Dukla Trencin. The Rush will spend nine of their next eleven games on the road, starting with a Friday night contest against the Kalamazoo Wings (18-19-0-2, 38pts) before heading to Toledo for a Saturday/Sunday contest against the Walleyes (24-10-3-2, 53pts). Weselowski said the team is looking forward to squaring off against new faces and skating in new buildings. The buzz in the locker room is positive approaching this road trip as an opportunity for a fresh start and a chance to turn their season around. Not an easy way to start a road trip but if the Rush want to make a statement then it has to start now. Can the Rush maintain their presence in the Mountain Division?